Before the iPad Mini, there was the Nexus 7. 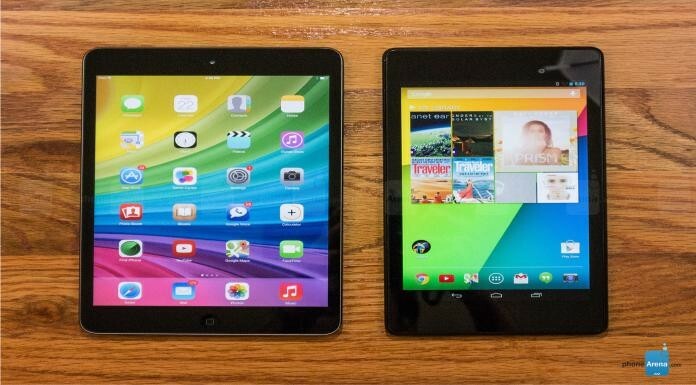 These two devices set the bar for small tablets. There wasn’t a lot of doubt that iPad Mini trumped the original Nexus 7, as it had more features. Now, however, with the arrival of the new Nexus 7, it looks like Google is back in the lead. Let’s look at some of the features and how the iPad Mini compares. The iPad Mini’s screen is larger than the new Nexus 7′s, but the iPad’s resolution is actually lower, at 1024×768 rather than the Nexus’ 1920×1080. Although without seeing the device we can’t determine color quality or brightness, Google clearly wins as far as the specs go. When it comes to processors, the new Nexus 7 has a Qualcomm Snapdragon S4 processor, measuring in at 1.5Ghz. It’s also OpenGL ES 3.0 capable, which means that it is certainly a better choice when it comes to playing games. The graphics are likely to be impressively smooth. How does the iPad Mini measure up? It has an A5 processor, much like the iPad 2 has. There’s nothing overtly wrong with it, but it is an older one, so you shouldn’t be expecting anything spectacular from it. In addition, the Nexus 7 boasts 2GB of RAM, while the iPad Mini only has 512MB. One of the biggest concerns about Apple products is the price. They can be expensive, and that’s certainly the case with the iPad Mini. For a 16GB device, Apple charges $329 while Google’s is only $229. The 32GB Nexus 7 gives you twice as much space for $269 – still cheaper than a 16GB iPad Mini. In comparison, the 32GB version of the iPad Mini is $429. If you want to Wi-Fi plus cellular connection you will have to pay $459 for the iPad Mini 16GB. But by using a promo code from AT&T you will save $100 instantly and get free shipping. Still, the new Nexus 7 is a better deal. If price is a factor in your tablet purchase, you can save over $150 by choosing the Nexus over the iPad. There are a few areas where the iPad Mini holds its own or wins out over the Nexus 7. For example, you get two color choices with the iPad Mini while the Nexus 7 is only in black. Both devices have a 5-megapixel rear-facing camera and a 1.2 megapixel front-facing camera, but we can’t be sure how they compare until we get a chance to try out the Nexus in person. Both are Bluetooth 4.0 capable, though only the Nexus 7 is NFC-enabled. The two devices run competing operation systems from Apple and Android. The iPad Mini runs iOS 6 currently but is expected to be iOS 7 capable in the fall. The Nexus 7 has the newest version of Android, 4.3 Jelly Bean. This means both tablets have or will soon have the most updated version of their respective operating systems, so which one is better for you is a matter of personal preference. In conclusion, simply looking at the specs, the Nexus 7 wins this battle. It’s got better features, a better processor, a better screen, and a better price. Google took everything that was good about their previous version of the Nexus 7 and improved it, giving us what promises to be a truly excellent small tablet. We’ll see how Apple responds when they reveal their next set of iPads.